Nicholas got a lot more than he bargained for when he decided to step in and help get Emma off death row! Emma was at the end of the line. On deck for euthanization at the Charlotte Animal Shelter in North Carolina, it seemed her fate had been sealed. And then a rescuing angel named Nicholas stepped in to save her … but Nicholas’ big-hearted act of kindness was even bigger than he thought! He had no idea that Emma was pregnant at the time of her rescue. 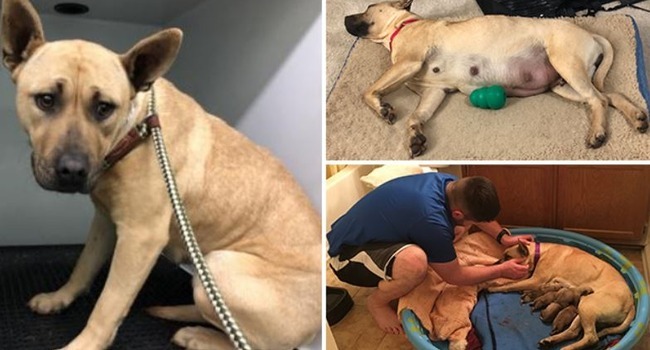 Nicholas’ friend had seen the dog and knowing her plight, and that Nicholas had fostered dogs in need before, put him in touch with Jesse’s Place Rescue, Inc. in Lake Wylie, SC. Predictably, Nicholas was up to help out and jumped in to coordinate Emma’s rescue. “I’m interested in fostering and possibly adopting this sweet girl…I’m very patient, calm, gentle, and have plenty of time to work with her. My last rescued boy died in 2016 from cancer,” he wrote to the organization, FOX13 reported. The rescue was able to pull Emma from death row and she went home with Nicholas — except no one at the shelter had mentioned that Emma was very, very pregnant! Luckily, Nicholas had some experience with birthing farm animals and opted to deliver Emma’s pups at home. When the time came, Emma gave birth to six puppies — two females and four males — without any difficulty. All the babies, and momma, are doing well and Nicholas has their care all under control! Were You This Happy About The Weekend Nor’Easter?